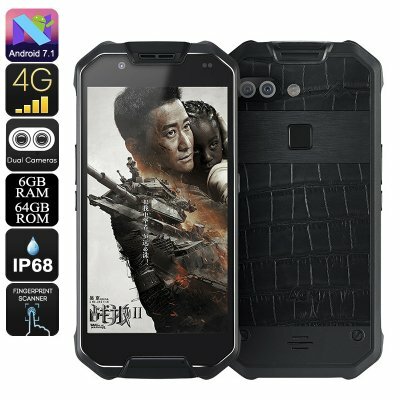 Successfully Added AGM X2 Rugged Phone - Octa-Core, Android 7.1, 6GB RAM, Dual-IMEI, 1080p Display, IP68 Waterproof, 4G, 12MP Dual-Camera (Leather) to your Shopping Cart. The leather version of the AGM X2 rugged smartphone features a high-end look and feel, making it a great phone for any occasion. With its IP68 rugged body, this Android 7.1 smartphone is fully waterproof. It is furthermore protected against dust and shocks. Thanks to this, you’ll be able to use your smartphone in any environment and weather condition. With its 6000mAh battery, it treats you to numerous hours of usage time. Therefore, you’ll be able to head out for the day without needing to worry about running out of juice. If you’re looking for a stylish Android phone that follows you anywhere you go, the AGM X2 smartphone is perfect for you. With its Dual-IMEI numbers and 4G support, this rugged Android phone keeps you connected anywhere you go. It lets you slide in two SIM cards and allows you to be reachable on both at the same time. This offers great possibilities for those of you who wish to separate work and private life into one device. To further increase your connectivity, the phone treats you to 4G network support. From now on, you’ll always be able to browse the web and enjoy the fastest mobile data speeds out there. On the phone’s beautiful 5.5-Inch display, you’ll be able to enjoy all your favorite media in crisp 1080p Full-HD resolutions. Your Android phone packs a powerful Octa-Core processor that has been clocked at 1.95GHz as well as 6GB RAM. This hardware lets you tackle the latest and most demanding software features currently available. With 64GB ROM and a 128GB SD card slot, there is plenty of space to store your media, games, and pictures. The latter can be snapped with the phone’s 12MP Dual-Rear camera that produces breathtaking images at any given moment. The AGM X2 Android phone comes with a 12 months warranty, brought to you by the leader in electronic devices as well as wholesale rugged phones..